Guardian Pool Fencing is committed to providing innovative home pool fencing solutions to Lemoore and all of the Central Valley. Since 2004, we have installed thousands of Guardian Pool Fence Systems, and have a well-established reputation throughout our service area for providing personalized customer service, expert craftsmanship, and exceptional quality mesh pool fencing systems at affordable prices. 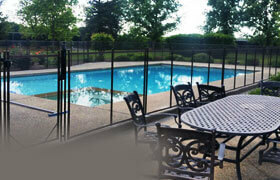 Guardian Pool Fence Systems, Inc. is a growing, international company with distributors all over the globe. Its founder and CEO, Steven Sadinsky, is a pioneer in the pool safety fence industry who founded the company with the goal of developing the safest, strongest, and most visually appealing mesh pool fencing system in the field. And with this vision in mind, he invented the first self-closing mesh pool fence gate expressly designed and engineered to be non-climbable by small children. Patent-protected since 1997, this unique gate design is used on all of the mesh pool fencing systems Guardian installs. It has no top cross bar, making it very difficult for children to climb. It also features a double pole truss system on either side, which allows the gate to self-adjust for any tension fluctuations which may occur along the fence line. This enables the gate to operate effectively at all times, independent of the remainder of the fencing system. In addition, our owner, Blaine Hall, was instrumental in developing Guardian's Patent-protected locking deck sleeve systems. Our Premier locking deck sleeve system has enabled Guardian's removable mesh pool fences to be approved by many municipalities as meeting building department code standards for pool safety fencing. Call Guardian Pool Fencing, for the safest, most innovative removable mesh pool fencing systems available in Lemoore today. We offer free onsite quotes to all of the Central Valley. 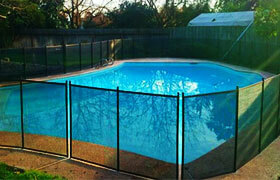 Guardian Pool Fencing has an A+ rating from Better Business Bureau, and is licensed, bonded, and insured. In 2002, Guardian Pool Fence Systems introduced our Premier Line fence, our strongest, most protective pool fencing system to date. Our Premier line system is offered to Lemoore in many durable meshes, including our pet mesh, features a patent-protected climb-proof, self-closing, and self-latching gate, and is distinguished by the incredible tensile strength of its fence poles. Our Premier Line features 1" diameter poles constructed of extruded 6063 T6 marine grade aluminum reinforced by a PVC center core. This core is then attached to a ½" diameter stainless steel rod which requires only a 5/8" diameter deck sleeve hole for installation. These poles are the strongest removable mesh pool fencing system poles available in the industry today, and are guaranteed to be unbreakable. In addition, as an added design bonus, the deck sleeve flange used for Premier pole installation is the same size as the pole, and is not visible when the pole is in place. Call us today from Lemoore. Framework finish – choice of black, brown, green, beige, or gray powder coat finish colors, as well as unfinished aluminum. Fence heights – 48", 54", and 60" standard heights. Custom heights also available. Mesh types – Choice of premier, Guardtex, and pet meshes. The unique design of the fence poles on our Premier Line Pool Fence System makes it the ideal pool fencing system for all types of Lemoore above ground pools, with either wood or composite decks. Due to the fact that it requires the drilling of very small holes for installation, our Premier Line will not compromise the structural integrity of wood and composite pool decks. And when these pool decks are not of sufficient thickness to support the deck sleeve holes required for the fence system, the fence poles can either be blocked from underneath the deck, or they can be drilled into a wood or composite strip attached to the decks surface. Our Premier Line Fence System is the best removable mesh fencing system in the industry for use on both ground level and above ground wood and composite pool decks. Our guaranteed unbreakable Premier Line Fence poles are constructed of 6063 T6 marine grade aluminum, and are reinforced by a PVC center core. 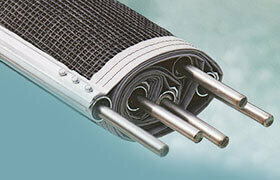 This core is then attached to a ½" diameter stainless steel rod. The small diameter of this insertion rod allows for the Premier Fence System to be installed by drilling installation holes for the deck sleeves which are only 5/8" in diameter — holes which are much smaller than those required by other mesh pool fence systems (which typically require their deck sleeve holes to be over an inch in diameter). And because of the small size required for its deck sleeve holes, Guardian's Premier Pool Fence line will not compromise the integrity or strength of either ground level or above ground wood or composite pool decks in Lemoore. Contact Guardian Pool Fencing today. We offer free onsite quotes to Lemoore and all of the Central Valley, and offer our superior removable mesh pool fences with a lifetime warranty. We accept MasterCard, Visa, Discover Card, and American Express. 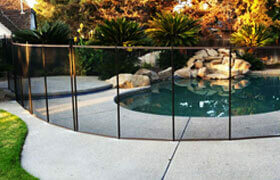 Guardian Pool Fencing is licensed, bonded, and insured.